When the opportunity came up for the chance to review EcoTraction I jumped at it! I mean any product that can get all five Dragons on the Dragon den working together has my attention. The other attention getting fact about EcoTraction is that they are a PTPA award winning product. There are few things that get me excited for snow to fall. I am the one grumbling when that first “pretty” snow covering appears. Well that changed this morning. There was a sprinkling of 3cm over night. The first thing I thought of when I saw the snow was “I hope the buses aren’t cancelled” then I thought “I get to try out my EcoTraction!”. This is our first winter back in Ontario. We have spent the last five years in Calgary. There is this wonderful phenomenon in Calgary called a Chinook wind. The warm wind blows… really BLOWS through town and melts everything. It is so reliable that the city of Calgary accounts for it in their snow removal budget. We never worried about ice and never used salt. When we moved back to the Ottawa Valley I quickly remembered what the walkway and driveway will look like. Things are different than 5 years ago for us. We have two little ones getting on the bus on the side of the highway and we have our rescue dog Miss Bella. 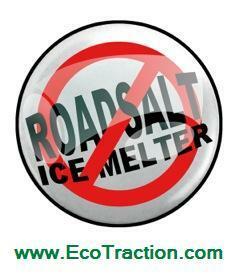 EcoTraction was created when the founder could not find no alternatives to harsh road salt. I did not know this but dogs can die from cancer stimulated by licking toxic road salt caught in their paws. Salt is also harmful to infrastructure, contaminates soil and pollutes water sources. Even sand that is used as an alternative has some salt mixed in to it. 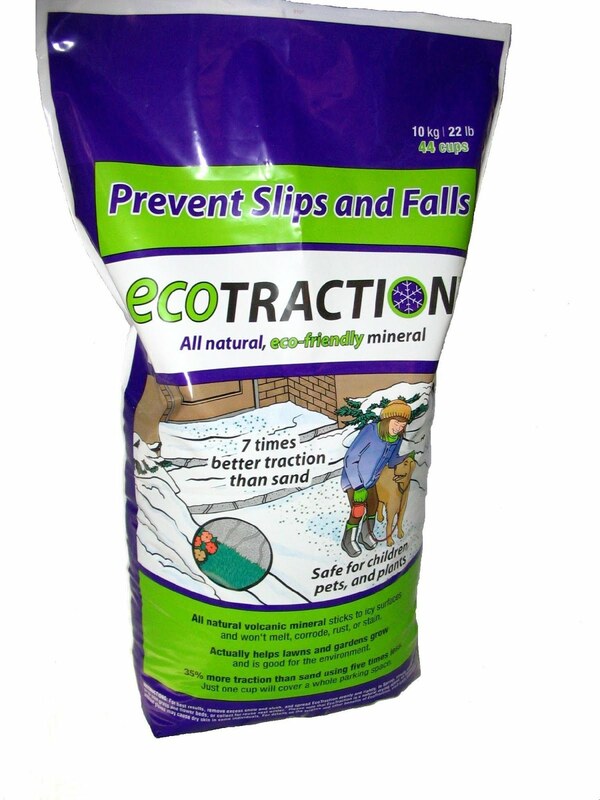 EcoTraction is made from a naturally-occurring volcanic mineral and is eco-friendly, kid-friendly, and pet-friendly. Simply sprinkle EcoTraction on snow or ice and it embeds itself in ice and snow creating a sandpaper like layer. EcoTraction granules can be swept into gardens and lawns to help them thrive in the spring. EcoTraction is also concentrated so that it covers 9x the ground of a comparable sized bag of salt. I would wholeheartedly recommend this product. I love that it is safe for the kids, dog, grass and our walkway. I love how easy it is to pour EcoTraction and get it where it needs to be! I love that it will instantly make my kids bustop along a busy highway safe. Knowing it is safe for our beloved family dog is a relief as well. I will have a slip free winter thanks to EcoTraction! One of you will be winning an EcoTraction Prize Pack! EcoTraction Prize Pack (a jug of EcoCompo MSRP $14.95, a jug of Ecotraction MSRP $11.95 and two boxes of EcoAirO ($7.95 each). Total ARV = $42.80! Giveaway is open to Canada only. I know you will love it! Some of my blogger friends are also hosting EcoTraction Giveaways. Feel free to check out their reviews and enter their giveaways! Good luck! Lots of chances to win. Remember though, you can only win once! I’ve never bought it before. But definitely looking forward to trying it after reading your review. i’ve never purchased it before but i will deff.. have to look!!!! Its right down the road from me!! :):) Didnt know that Home Depot sold this product! Thanks so much for the chance! Looks interesting. Will look for it in Home Depot. 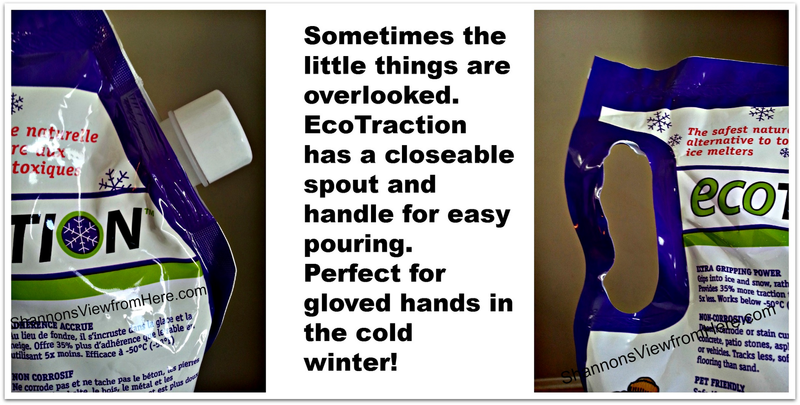 I would go to Shopper’s Drug Mart in Esquimalt, BC to purchase Ecotraction! I did not know it existed but the product sounds exactly like what we could use around here in the winter! I love also that it is eco friendly! I would purchase it at Shoppers Drug Mart, Canadian Tire OR Home Depot. I would buy it at Canadian Tire! I love your reasons for using EcoTRACTION! What a fantastic product! Thank you so much for sharing it with your readers. I would go to Home Hardware in my town (if they carry it). I would go to Canadian Tire or Home Hardware. I would go to Canadian Tire to purchase it in my town. I would buy it at Canadian Tire. I would go to Canadian Tire. Shoppers – there’s a location right around the corner from me! I’d go to Canadian Tire to get it. CANADIAN TIRE(Bells Corners) is where I would purchase this product. I would go to Shoppers Drug Mart just down the street. I have multiple choices stores within two minutes. I would check Shoppers when I stop for milk then across the street to Giant Tiger if I need to. I’d buy it at Shopper’s Drug Mart; it’s very close by. I’d go to Shoppers Drugmart for EcoTraction. I would be going to Canadian Tire to buy mine.. Great product! I would go to Shopper’s Drug Mart! Wow — this is exactly the kind of product I’ve been looking for. I’d check my local Shoppers Drug Mart for it, and if they don’t carry it, I’d try my nearest Home Hardware, and failing that, the closest Canadian Tire store.